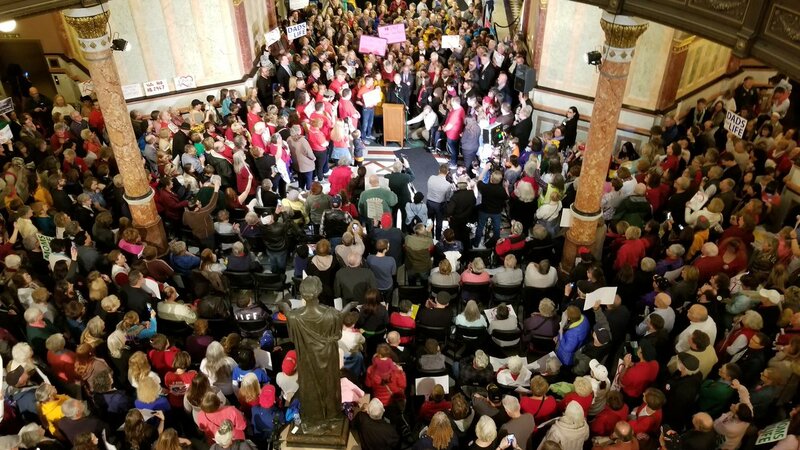 Pro-lifers flooded the Illinois Capitol on Wednesday in opposition to several radical pro-abortion bills that would allow unborn babies to be aborted up to birth. Photos on Illinois Right to Life’s Facebook page show pro-lifers packed in the capitol rotunda. The pro-life group said more people stood outside the building because they could not get inside. The pro-abortion legislation would treat abortion as a “fundamental right” and strip away even minor protections for unborn babies and medical professionals who object to abortions. Capitol News Illinois reports the Reproductive Health Act (House Bill 2495) appears likely to pass with Democrats in control of both state houses and the governor’s office. Gov. J.B. Pritzker supports the bill. But pro-lifers have renewed hope after state residents turned out in huge numbers on Wednesday. According to Illinois Right to Life Action, more than 10,000 people have filed witness slips against the legislation – the strongest opposition that pro-life lobbyist Ralph Rivera said he has ever seen. Several state lawmakers joined pro-lifers in the capitol to condemn the proposed abortion expansion. State Rep. Avery Bourne, a pro-life Republican who is pregnant with her son, slammed the legislation for allowing healthy, viable unborn babies to be aborted for basically any reason, according to the report. “I have a healthy baby, I’m healthy, and the people who are pushing this would say that it could be my decision to end his life when he has a 62 percent chance of living if he were born today,” Bourne said. She said even most pro-choice Illinoisans disagree with extreme abortion expansions, The State Journal-Register reports. However, state Rep. Kelly Cassidy, one of the pro-abortion Democrats sponsoring House Bill 2495, claimed the bill simply would strip unenforceable abortion restrictions from state law. But polls show that the public does not support such radical proposals. A recent national poll by Marist University found that three in four Americans (75 percent) say abortion should be limited to – at most – the first three months of pregnancy. This includes most Republicans (92 percent), Independents (78 percent) and Democrats (60 percent). If the legislation passes in Illinois, it would prohibit the state from interfering in any way with abortions. It would erase criminal penalties for performing abortions and allow non-doctors to do them. The legislation also would repeal the partial-birth abortion ban, abortion clinic regulations and conscience protections for medical workers. A second bill also would repeal the state parental notification law, which requires underage girls to inform at least one parent before she has an abortion. The bills are pending in the 101st General Assembly as House Bills 2467 & 2495 and Senate Bills 1594 & 1942. The Thomas More Society detailed analysis can be found here. ACTION: Contact Illinois lawmakers to oppose the bill.